Being so far down the zoological food chain, snakes are instinctually on guard and combatant. While hostility might be a snake's immediate reaction, experienced snake handlers do not define them as aggressive, but as displaying natural snake behavior. Responsible snake owners understand their pet's instinctual behavior and make allowances for their safety as well as the snake's. Misreading a snake's behavior is common, even with professional snake handlers. 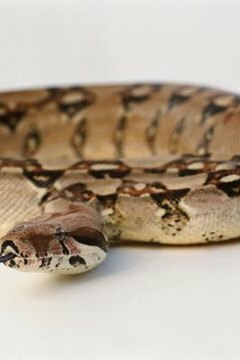 As they do with other pets, owners often want to attach emotionalism to their snakes, but reptiles do not respond emotionally. A more appropriate understanding of a snake's apparent aggressiveness is to read the displayed behavior as being defensive. A snake will react unpredictable with people, until it reaches a point where it feels safe. With repeated handling, a snake will become acclimated with its handler and therefore more predictable. A snake that is gently handled on a regular basis will lose fear and uncertainty of people. With snakes, what might appear as aggression is a fear-based reaction, and the most primal inclination of all living things, the "fight or flight" response. Snakes will always act instinctually, and these are instincts that have been embedded over 150 million years. Paleontologists have traced this terrestrial vertebrate's evolutionary chronicle to the Jurassic period. Since their inception, snakes have had an innumerable list of predators that see them as food. In any contingency, and given the opportunity, a snake will always flee rather than stay and fight. Snakes always have a reason for their actions. Given the right set of circumstances, a snake will lash out and bite. A snake that has not received sufficient nutrition will test bite a person's hand because it is warm-blooded, the right size and moving. If a female snake is in a gestation period, she will be overly defensive and react as a protective mother. When a snake is shedding, or molting, the reptile experiences a vulnerability much like apprehension. Keratinous scales are renewed when shedding, and a thin layer of old skin covers the snakes eyes. Shedding is a stressful time for a snake, and it's not advisable to handle a snake in that condition. Of all of the world's population, the No. 2 thing people fear most is snakes. Often, when people encounter a snake in the wild, their immediate reaction is to kill it. Herpetologists, scientists who study snakes, say the snake plays a substantial biological role in every ecosystem on the planet, except those of the polar regions. Less than 40 percent of the world's snake species are venomous. Therefore, more than half of the world's snakes are nonvenomous, and generally harmless to humans. Population Decline of Snakes in the U.S. When Are Rattlesnakes the Most Aggressive?